The Sabra and Shatila massacre in Lebanon in 1982 was a massacre of Muslims carried out by Christians. But it is remembered because Israel can possibly be blamed. Massacres in Lebanon where Israel cannot be blamed are forgotten. Jewish Virtual Library on the massacre. The Sabra and Shatila massacre was a brutal massacre of Palestinians, carried out by Lebanese Christians who were allied with Israel, and who were themselves avenging similar massacres of Lebanese Christians carried out by the Palestinians. The leader of the Sabra and Shatila massacre was the war criminal Elie Hobeika. His fiancée had been raped and murdered in 1976 by the Palestinians in the Damour massacre of Christians by Arafat's PLO and other Palestinians. Hobeika was never arrested for the 1982 Sabra and Shatila massacre. Arafat was never arrested for the 1976 Damour massacre. It was his own men that carried it out. But no arrest. And no calls for his arrest from the western left. Hypocrites. Even though no Israelis carried out the 1982 Sabra and Shatila massacre, 300,000 Israelis demonstrated against it, furious that Israel had not stopped it, even though the Palestinians were their enemies. This is the difference between the Israelis and the Palestinians. When have Palestinians ever demonstrated in large numbers following a killing of Israeli innocents? If this has ever happened, let me know here. Likewise, an Israeli inquiry sacked the Defense Minister Ariel Sharon, and sacked and demoted other senior figures in the army and intelligence. When have the Palestinians ever held an inquiry into the killing of Israeli innocents? If this has ever happened, let me know here. While I can understand the fury directed at the Israelis (such as Sharon) who failed to prevent the massacre, I cannot understand why all the fury seems to be directed at them. Surely 90 percent of the fury should be directed at the people who actually carried out the massacre, butchers like Elie Hobeika, and the people who carried out other similar massacres at the time, butchers like Yasser Arafat. 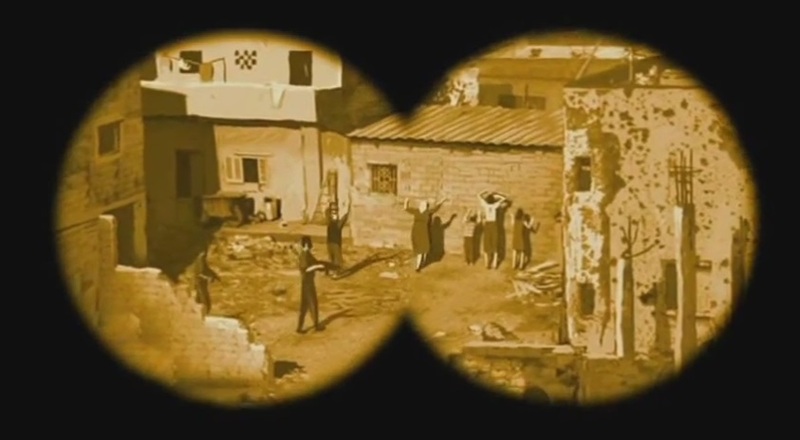 Waltz with Bashir (2008), an anti-war film against Israel's actions in Lebanon. It's about the Sabra and Shatila massacre of 1982, though in fairness it shows Israel didn't do it. It is widely claimed by leftists and anti-Israel people that Ariel Sharon was found "personally responsible" for the massacre by the Kahan Commission. Of course this is rubbish. The Christian Arab killers were personally responsible for the massacre. Sharon was merely found personally responsible for not foreseeing it and not acting when reports came in. That is, negligent but not a war criminal. To be a war criminal you have to actually commit the war crimes. The Commentator notes that Sharon once said: "I'm the only minister of defence in the world - the only one - who left his post and went back to work on a tractor, on his farm, as a result of what Christians did to Muslims. The only one." 1983: This is the summary (top) and conclusion (bottom) about Sharon in the report into the massacre by the Kahan Commission (1983). 1983: The Kahan report found that: "No intention existed on the part of any Israeli element to harm the non-combatant population in the camps." 1999: Page 440 of the book Crimes Against Humanity in International Criminal Law (1999) by Mahmoud Cherif Bassiouni. This inserts the words "[for the massacres]" into the text, changing its meaning. 2002: Page 40 (a 2002 essay) in the collection The Age of the Warrior (2008) by Robert Fisk repeats the same distortion. 2011: Page 114 of the book Freedom Next Time (2011) by John Pilger repeats the same distortion. Wikipedia widely spread lies about Ariel Sharon and the Sabra and Shatila massacre after his death in Jan 2014. It claimed he was found "personally responsible" for the massacre. 1 Jan 2014: Wikipedia article on Ariel Sharon as at 1 Jan 2014. Mid-Jan 2014: Wikipedia article on Ariel Sharon shortly after his death on 11 Jan 2014. A lie. It says the Kahan Commission "concluded that Sharon bore personal responsibility for the massacre". Of course the Kahan Commission said no such thing. It is telling that this is a paraphrase, not a quote from the Kahan Commission. A fake reference. It claims as a source "" which is this article, which says no such thing. 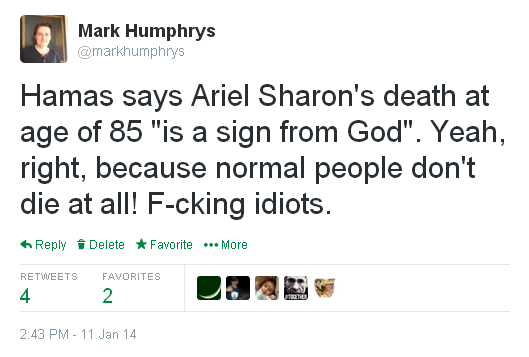 Leftists printed all sorts of outrageous slander about Ariel Sharon after his death in Jan 2014. Basically, they accused him of an involvement in the Sabra and Shatila massacre that he did not have. As shown above, the claim that he was found to have "personal responsibility" for the massacre is simply not true. Human Rights Watch, 11 Jan 2014: "An Israeli commission of inquiry found that he bore "personal responsibility" for the massacre". Mehdi Hasan, 12 Jan 2014: "a formal Israeli commission of inquiry ... found Sharon bore "personal responsibility" for the Sabra and Shatila killings". The Guardian editorial, 12 Jan 2014. Introduces the massacre and then says: "An Israeli government inquiry concluded that Mr Sharon bore personal responsibility for the incident." Paul Reynolds, Jan 2014: "He was overseer at Sabra and Shatilla massacres. ... Israel found him 'personally responsible' for massacre. ... He was a war criminal in eyes of Israelis ... Even the Israelis won't argue that the guy was a mass murderer. ... The Kahan Commission found him 'personally responsible'." Paul Reynolds didn't like me pointing this out. He blocked me. Taxpayers in Ireland are forced by law to pay for state-funded RTE to spread its anti-Israel bias. See RTE's outrageous coverage of Ariel Sharon's death. 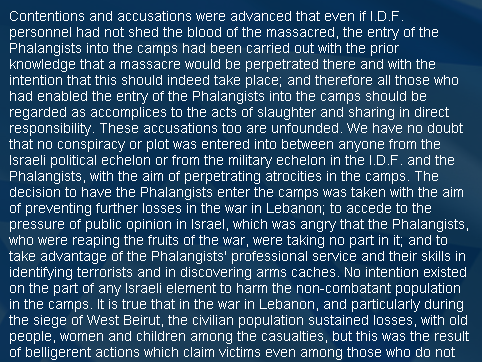 Max Blumenthal in The Nation claims that: "Sharon and many of his officers were well aware of the Phalangists' intention to murder as many women and children as they could." No evidence is provided of this. Irish Israel-hater Bock the Robber goes further, 13 Jan 2014: "the Sabra and Chatila massacres, carried out on Sharon's orders by Saad Haddad's SLA ... These were the proxies for the Israeli Defence Forces, and they went about their business with savage gusto, under the benign, watchful eye of Ariel Sharon, slaughtering people he regarded as vermin. ... An Israeli commission of inquiry found that Sharon carried personal responsibility for the massacre". Damien Kiberd, 26 Jan 2014, is not as crude as the above writers. He is more subtle. He says about Sabra/Shatila: "Sharon tried the old Ben-Gurion trick of shifting the blame. He said that it was the work of a vengeful Christian militia." But, as Rob Harris points out, it was the work of a vengeful Christian militia! Kiberd uses the phrasing "He said" in order to cast doubt on Christian responsibility and blame the Israelis instead. Irish Times fanatic claims that Ariel Sharon "supervised" the Sabra and Shatila massacre, 16 Jan 2014. Anti-Israel fanatic Eamonn McCann says, based on no evidence whatsoever, that: "Sharon will have believed as he went about his work that he was wielding the sword of God - and will have had the same sense of righteousness when supervising the Phalangists' pitiless butchery of more than 2,000 Palestinian refugees in Sabra and Shatila in Lebanon in 1982." 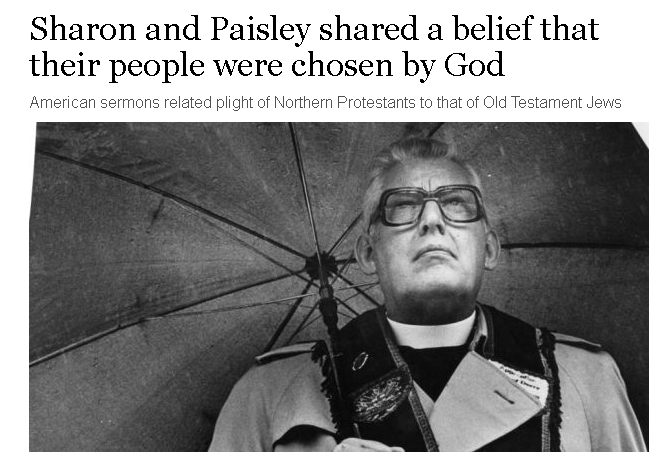 The Irish Times will publish any old stuff about Sharon, it seems. 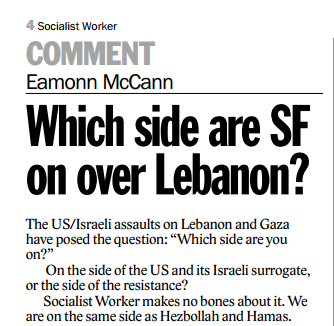 Eamonn McCann is a supporter of Hezbollah and Hamas. In fairness, Hamas' take on Sharon's death was pretty funny. 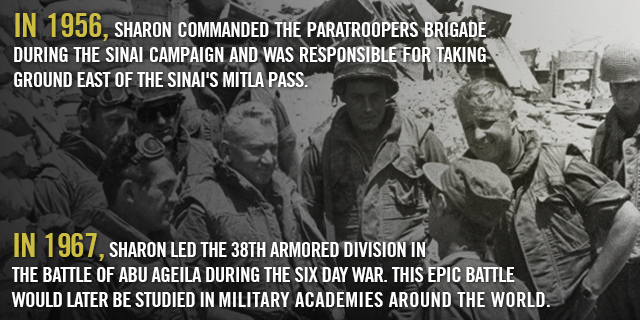 Ariel Sharon helped save the Jews of Israel from genocide in 1967. 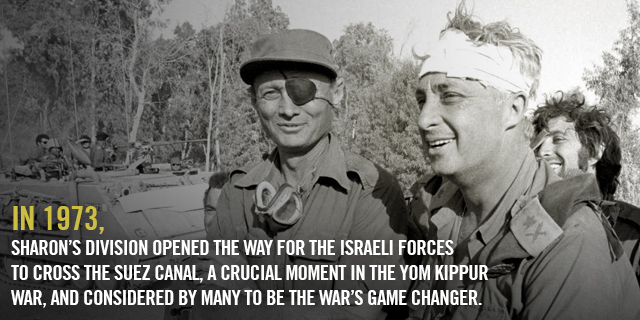 Ariel Sharon helped save the Jews of Israel from genocide in 1973.